George Osborne, the Chancellor of the Exchequer (that's the archaic name we use for our finance minister in the UK, I have to explain for my overseas readers) has announced that he will be using £40 billion of public money to underwrite bank loans to small businesses, as there is perceived to be a problem with these businesses not being able to obtain credit from the banks, and this is said to be hindering the "recovery". What this amounts to is the government taking over part of the banks' job for them, using the its ability to borrow money at low interest rates to subsidise the loans to businesses. It would mean firms being able to borrow at 4% rather than 5%. Across the political spectrum this is generally regarded as being a good thing. But it seems to me strange that a Conservative chancellor is effectively nationalising banking in this way. Is this not big-statism, and an interference in the normal commercial working of the banking system, things to which you would expect right-wing politicians naturally to be opposed? What are the implications of this? The government is able to borrow money at low rates of interest because it is perceived by lenders to be at very low risk of defaulting. Businesses are charged a higher rate by the same lenders because they pose a higher risk. If there is a problem with firms being able to obtain credit, this must be because the banks do not feel certain enough that they will be able to make a profit on the lending without charging a high rate. The credit problem is not a problem with banks being nasty or selfish, it is indicative of underlying contraction or stagnation in the economy: a recession without "recovery". By nationalising part of the risk of lending to businesses at low rates, the government must reduce its own creditworthiness, creating a risk that it will be charged marginally higher rates in the longer term, as the risks of businesses defaulting on their loans are transferred through government accounts. To an extent, therefore, in an indirect way, this government is advocating a similar approach to that which it is so ready to criticise in the heavily-indebted European countries like Greece and Italy, where interest rates charged to government have spiralled because of uncertainly about repayment in the long term. Where there is uncertainty about economic expansion in the near future, there is no free, easy way out of a credit crunch. The government juggling bits of the lending system between public and private sectors is a sticking-plaster solution which cannot change anything fundamentally because the recession is really out there, for reasons other than what banks do. Somehow politicians and the media have managed to convince the public that the recession is a product of the problems of the banking sector, rather than the problems in banking being just a symptom of a real fundamental economic problem. The recession was all caused by unwise mortgage lending in the USA, according to many. More recently, the stress has been on the idea that it is all the fault of those running the Euro. I have always believed that there is an underlying recession which exists because of the reasons that recessions and depressions always occur: commodity shortages and environmental issues, which are opposite sides of the same coin. Problems in banks and national banks are just a delayed manifestation (delayed by borrowing on the future) of the costs coming through due to the effects of global warming, other environmental problems associated with energy-intensive development, and demand for essential commodities outstripping supply with world population growth and the rapid expansion of the emerging economies. The answers to the crisis are not fiddling with banking and taxation or even radically cutting public expenditure, which will just have to be increased again in the future to sort out the problems created by the current round of cuts. The answers lie in sustainable development, particularly reducing reliance on fossil fuels, better, more efficient planning of society (not a laissez-faire "business always knows best" approach), reviving manufacturing industry, engineering and science, the activities which genuinely create wealth, as opposed to speculation, which does not, making people skilled and productive in areas that genuinely benefit society, making society fairer, more democratic, equal and hence better-satisfied, and above all, controlling global warming and developing a climatically stable and fair development path for the whole planet. Not easy. The hardest thing will be to convince people that they have to get used to the fact that growth, as defined in the past, will have to stop. There may never be a "recovery". That does not mean that peoples' lives will get worse however. They will have to change. The big challenge for politicians is explaining the difference. One of the first cycle superhighways takes you round the back of Elephant & Castle – that cunning little cut-through that I sometimes use. Though I have to tell you ...sometimes I just go round Elephant & Castle because it's fine. If you keep your wits about you, Elephant & Castle is perfectly negotiable. 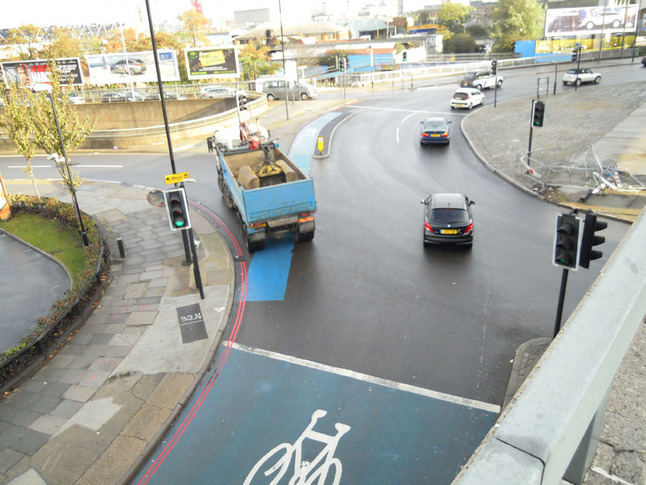 Transport for London (TfL) director Ben Plowden promised to look "very closely" at the cycling superhighway which ran through the Bow Roundabout. He also said cyclists would be advised to avoid the route, which runs to the Olympic Park, during next year's Games. Where else cyclists will be advised to go, to get to the Games, is not clear to me. Also, the question is, what is there to look at "very closely", that was not looked at last year when the design of the Superhighway was decided upon against all advice from cycle campaigners? Nothing has changed. TfL took a deliberate decision then to risk the lives of cyclists rather than produce a proper design for cycling. 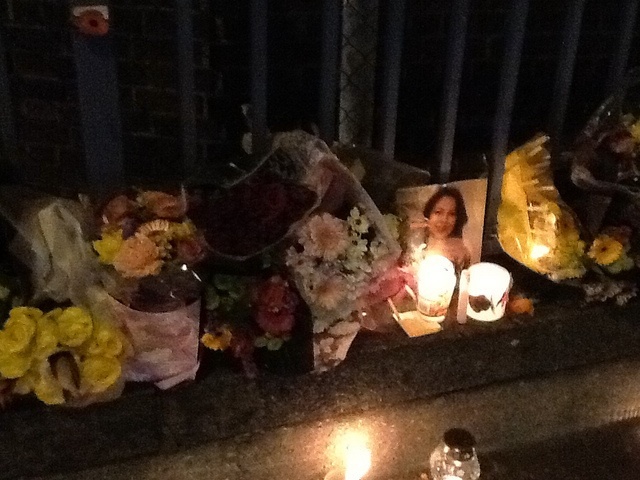 The two cyclists who have died there paid the price of that decision. Looking at this one roundabout "very closely" will not fix it, nor any of the others of hundreds of dangerous junctions and roads in London, without a fundamental change of approach from TfL. The Mayor is an experienced cyclist who wants roads that are safe for him to cycle around. In contrast, I am an experienced cyclist who wants roads that are safe for a twelve year old to cycle on. That is the gulf between us. As an experienced motorist, cyclist, cycling instructor and trainer of cycling instructors I'd like to say that the Elephant & Castle and the majority of the Cycling Superhighways are bloody awful for cycling - which is why you hardly see any secondary school children, especially girls, cycling there. Charlie later changed the last word to "buffoon", but I prefer his original. My option is that we should not take part. I am certainly not inclined to take part after having put a lot of effort into LCN+5 (more or less the same thing as Highway 11) which achieved absolutely nothing. I think the whole LCC policy on the Highways (or are they Superhighways, TfL can't seem to make up its mind) is now wrong. We should rethink. I think we should not be co-operating with this project as the information with we have been supplied, particularly the presentation from last week's meeting at LCC, indicates that both the funding and the conception behind these routes is so calamitously inadequate to the task that they will be a total waste of time and money, and, worse, will attract inexperienced cyclists onto main road routes that have not been made any safer than they are now, with junctions that are still highly dangerous and unsuitable for all but the most skilled with-traffic cyclists. "The TfL presentation makes clear that the infrastructure element will be accompanied by soft measures such as cycle training, parking and promotion of cycling." In fact, the presentation makes clear there will be no infrastructure element. Even the few slightly promising-sounding elements in the earlier (May) TfL presentation, particularly closing-off side roads along the routes, and "reorganising" parking and loading, seem to have been ruled out in last week's presentation, on Slide 9, "Constraints" where it says "Cycle Superhighways does not have the time or the budget to... seek major changes to traffic operations (e.g. via side road orders or controversial Traffic Regulation Orders". If B[oris] J[ohnson] did not realise that prioritising cycling would be controversial, why did he start on this in the first place? The next paragraph on that slide is key for Route 11: the statement "The Boroughs are King". 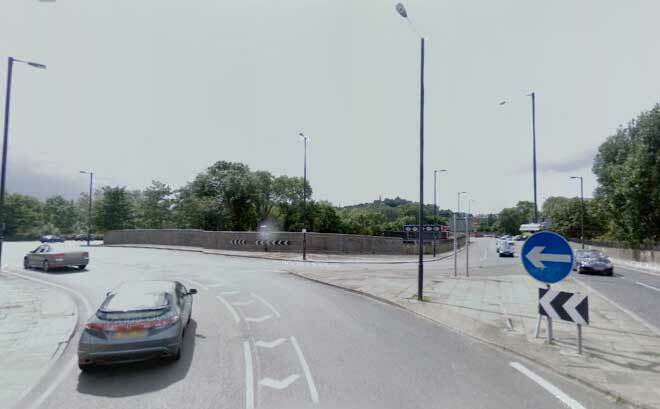 LB Barnet continues to be totally opposed to putting a route on the A5. It stopped LCN+5 and it will stop this. There is absolutely no point in us putting any more work into it before we get a definitive statement of a change of policy from Barnet. All the issues for the section from Kilburn High Road northwards have been covered fully in the LCN+5 CRISP report anyway. In short, though I can see the argument that LCC needs to make the Highways as good as possible within the constraints, after last week's presentation, I think the balance of advantages to LCC (and London cyclists) has now shifted to one where we would gain more from publicly opposing the Highways scheme, and making a big media thing of doing so, rather than from being associated with the total failure and embarrassment that they will surely be. Am I alone in LCC in thinking this? This is a complete and unabridged quote from the email that I wrote in August 2009. I found the policy of conciliation and cooperation with TfL on the manifest impending disaster of the Superhighways, favoured by Koy Thomson, "for fear of losing all influence" to be very unfortunate. Since then, and with a new chief executive, LCC has changed its tone on the Superhighways a great deal, and I support their current position. I was perfectly right then in pointing to the fundamental problem that anti-cycling boroughs like Barnet were able to veto the Superhighways. 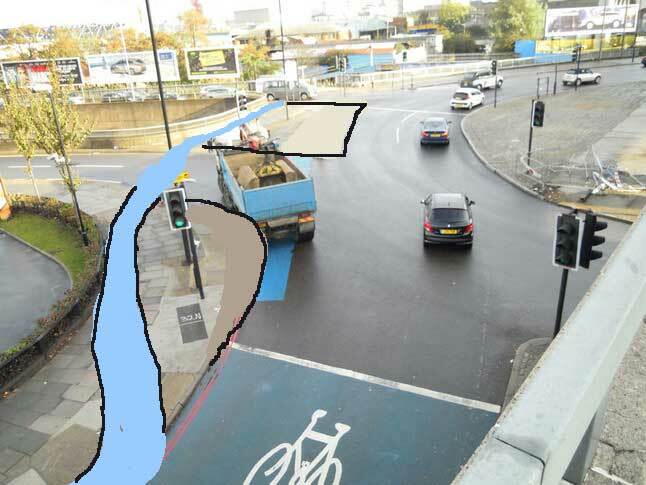 That is what happened to CS 2 when it reached the borough of Newham. 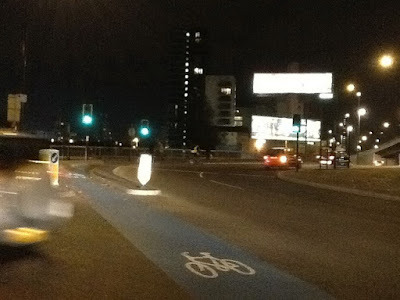 The anti-cycling Mayor of Newham, Robin Wales, caused CS 2 to stop dead at the Bow roundabout, with no further facilities. 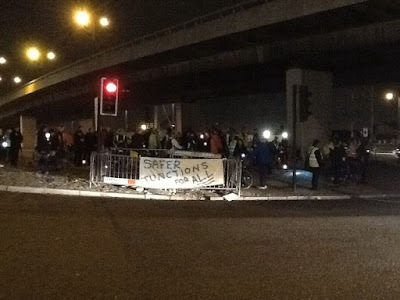 The Superhighway may not have been any better implemented on that roundabout had Wales allowed it to continue into Newham, for, as Assembly Member John Biggs was told, it was TfL, not Newham, that was so obsessed with not reducing the traffic capacity of the Bow roundabout as to not be prepared to put in any signals for pedestrians or cyclists. 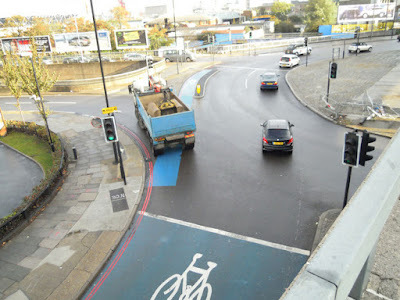 Cycle Superhighway 11 has not yet been "built" (i.e. painted), but it is now planned, like CS 2, to just end, bang on the border of the Bikeless Borough of Barnet, at another nasty junction (the junction of the A41 Hendon Way and Finchley Road), where cyclists will, again, just be "dumped". Joanne McCartney (AM): This Committee looked at cycle superhighways and we came up with a list of recommendations which included having a minimum standard on all of the superhighways, for example a minimum two metre wide blue strip, about improving consultation prior to a superhighway going in and about revisiting the pilots to make any improvements that were necessary. I am just wondering how you got on with some of those recommendations? Leon Daniels (Managing Director of Surface Transport, TfL): Again, loads of lessons to learn from the initial cycle superhighway not just in respect of the superhighway schemes themselves but also the way in which the construction is done and the disruption to general traffic and so on. 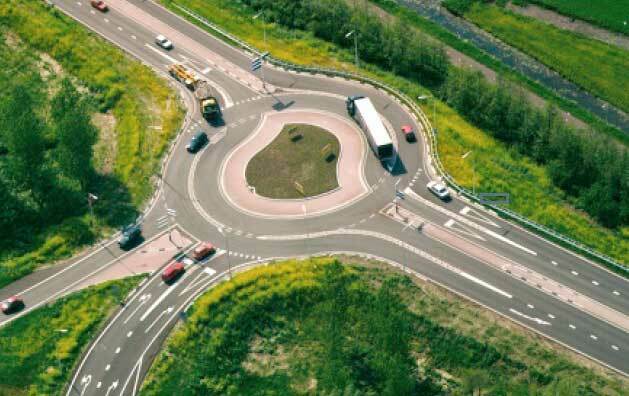 In just about every case we are looking to - this is a big compromise because, at the end of the day, the carriageway space is fixed and therefore we are trying to squeeze a quart into a pint pot. I agree entirely with you about minimum widths and so on. Just in some places, on the ground, practically, we are faced with what we have to do. In many cases - and Members will know some of these - there is a requirement for a certain footway width, the frontages need some space, there are requirements for loading and unloading, we need to keep ordinary traffic moving as well and, therefore, in many cases, we are shoehorning this into a narrow space. 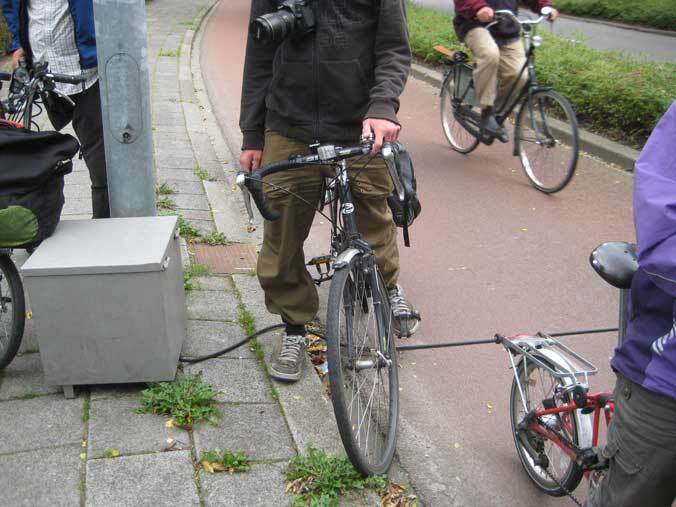 I agree entirely with you that a minimum width for cyclists is desirable but, again in many cases, we are stuck with what we can do practically and cost effectively. So there you have it. It's a case of "trying to squeeze a quart into a pint pot". It's a case of a minimum width being desirable, but "we are stuck with what we can do practically". What Daniels is clearly saying here is that, though this is supposed to be a scheme for cycling, cyclists are, in reality, still at the bottom of the pile on these roads. Footway requirements can't be altered, loading requirements can't be altered, and capacity for "ordinary traffic" can't be reduced (he might as well have said "proper traffic", that would probably have better reflected the way he was thinking), so the thing that has to "give" is space for cycling. 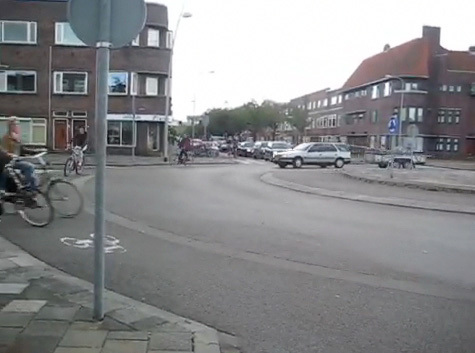 Cycling needs no space, right, because cycles are so narrow? After starting by saying "Loads of lessons to learn", Daniels makes it crystal clear he is learning nothing at all. He is sticking to the same old "big compromise" line (i.e. compromise into meaninglessness) that has caused all London cycle infrastructure schemes over the last 20 years to fail, from the London Cycle Network, to LCN+, to the present. I don't think Daniels, or Johnson, have the slightest idea what proper cycling infrastructure looks like, what it actually does, or how it can be implemented. I don't know if they have seen what they have in Holland, Denmark and Germany. Maybe they have, but just concluded, in classic British fashion, "This is not why they cycle here, they cycle here because it is flat". Presumably they have never seen the cycling infrastructure in Switzerland, Austria and Italy. Certainly Boris seems to make a big thing out of hills. 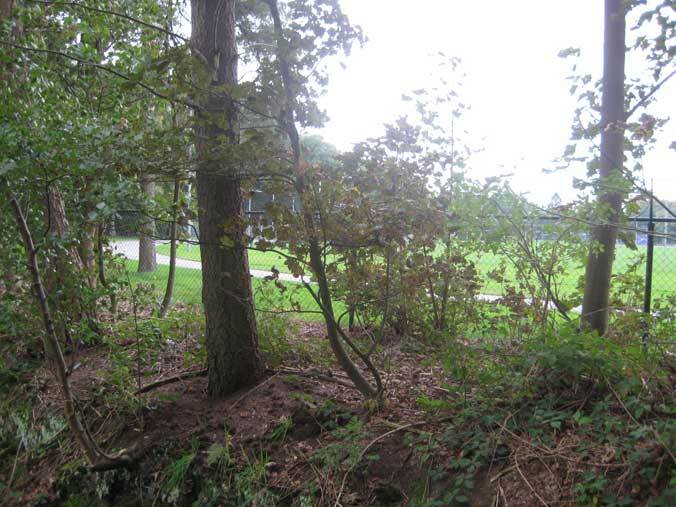 When the ex-coordinator of Harrow Cyclists, Colin Waters, tacked Boris at a public meeting in March 2010 in Harrow School, on the question of why the Superhighways were no good, Boris totally avoided the question, turning it to humour, loudly asking Colin, to the audience, "Goodness me, did you cycle here? Up this fearsome hill? Congratulate that man, give him a round of applause!" Boris's vision of a "cycle-ised city" (a phrase he copied from LCC) seems to be of a city pretty much as it is now, with perhaps a few more cyclists fitted in, in the gaps between the cars, just to take up space more efficiently, and take a few more people off the tubes. It's not a vision of the radically reconfigured, re-prioritised, safe, people-friendly environment developed by the Dutch and Danes. For some reason, he thinks that's no good, or not possible here. 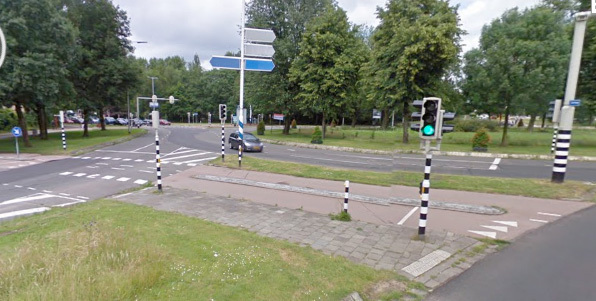 The fact that, in his vision, some cyclists fitted into those little gaps are inevitably going to get squashed by the motor vehicles doesn't seem to occur to him, or if it does, he thinks he can't do anything about it. He thinks that "physical streetworks are not the answer". He won't admit the bleeding obvious, that it is the physical state of his streets now that is the problem. I don't really see him and his cohorts moving on from that position. We need change at the top. And so I cycled off yesterday, armed against the darkness and damp of November with a new Schmidt dynohub, which perhaps I will review sometime (brief review: it is a superb gadget), to plan Brent Cyclists' Infrastructure Safari. This ride will take place this Saturday, 12 November. I am sorry that it coincides with another high-profile ride in central London, Mark and Danny's Tour of TfL's 10 most dangerous junctions for cyclists, but my ride was scheduled first. Its idea is somewhat the reverse of Mark and Danny's ride. We will not be deliberately going to dangerous places. The idea of this ride is a constructive one, to look at as many implemented examples of cycle infrastructure in inner London as possible on a short ride, to critique them and assess how they are working, note how they could be improved, and also note locations with no infrastructure, which patently need it. What I am going to say next is purely based on subjective opinion arising out of my exploratory ride yesterday, interspersed with the odd fact, but I think it is worth saying, bearing in mind the highly negative (but I believe realistic) articles I have written recently about the state of cycling in outer London. It should be borne in mind that when I lived in the Borough of Camden, up until eight years ago, I cycled in inner London every day. 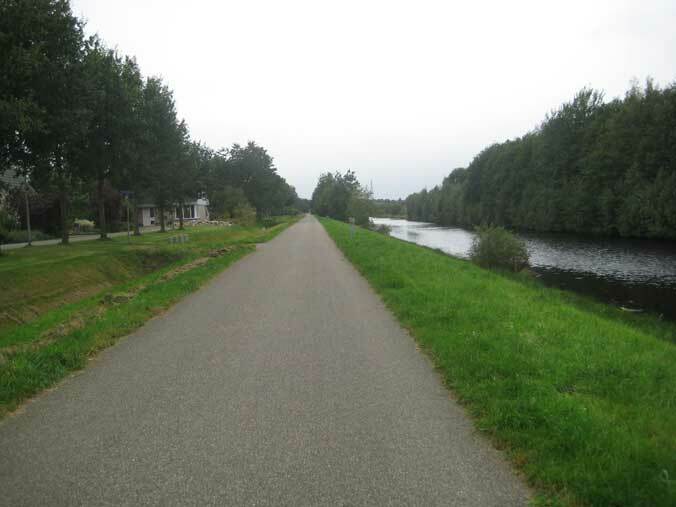 Since moving to the outer suburbs, I have been cycling less to the centre. So I am perhaps more likely to notice the gradual changes there, on the occasions when I do cycle down, than those who now cycle there every day. The disclaimer is that because I was exploring cycle infrastructure, I was likely to be going to places where more cyclists are; even poor cycle infrastructure has some positive effect on cycling numbers, in my experience. Also I was cycling around at peak time on a weekday. What I have to say is that I got the feeling that cycling in inner London, particularly in Camden, Islington, Southwark and the City, has taken off in a new way, that I had not seen before, and is now probably on an irreversible upward trend. Last week, at an event I attended in Parliament, on behalf of the Cycling Embassy of Great Britain, the Cycle Rail Awards Ceremony (never mind what that is, it's not important), the well-known transport commentator Christian Wolmar stated that "cycling in parts of London has now almost reached Dutch levels". This is an exaggeration. The highest-cycling borough, Hackney, had, in 2009, a mode share of 6% officially recorded, and though it might have gone up since, it is unlikely to be comparable with the mode share of cycling in Dutch city centres, which I guess would be typically above 50%, since they have whole cities, including suburbs, with a mode share of 30–50%. Nevertheless I felt, riding yesterday, that a qualitative as well as a quantitative change has occurred in cycling in central London. It felt very different to how it felt only a couple of years ago. It is also starting to look different. Yes, it is still dominated by young to middle-aged men wearing high-viz and helmets and riding fast bikes fast, but not so much as before. There seems now to be a high proportion of women in the mix, mostly young women. There seem to be more continental-style bikes on the road – practical, town bikes with hub gears, mudguards and chainguards, integral lighting, luggage-carrying features, and an upright riding position. 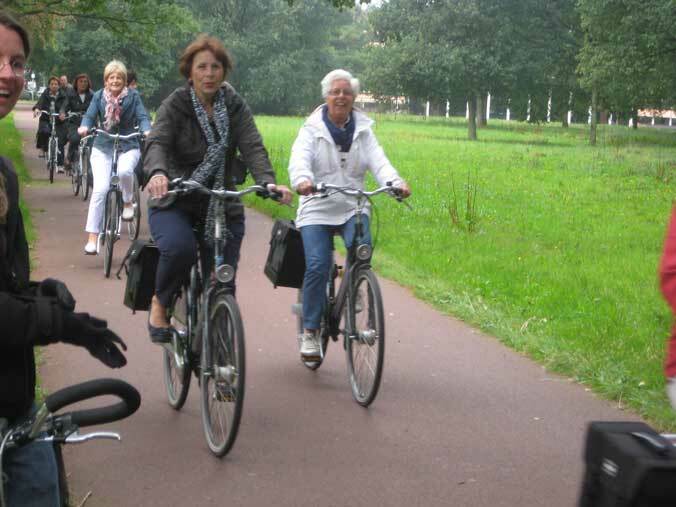 I even saw a lady on a sit-up-and-beg bike with handlebars decorated with flowers, as you see all the time in the Netherlands. The sedateness of the Boris Bikes seemed to have made its impact on the cycling atmosphere as well. Starting my journey from north Brent, I saw there is still no cycling at all to speak of north of the North Circular Road. But after going through the horrible Neasden pedestrian/cycle underpass, getting into south Brent, on the quieter backstreet routes and in the parks, I was seeing women on bikes, and even families of children on bikes. And from Camden Town onwards there seemed to be a flood of people on bikes. When I cycled around Camden a decade and more ago (when I was involved in planning the Camden segregated cycle tracks with Camden Cycling Campaign), when I stopped at junctions, I would need to be wary of the cars around me, wondering what the drivers were likely to do, but I would not have checked for the presence of cyclists behind me, because there would never have been any (as in outer London today). But yesterday there seemed to be cyclists behind me all the time, if they were not in front or to the sides. The cycle facilities in inner London still do not make up anything resembling a coherent network, on the Dutch or Danish or German pattern, but some of the gaps that used to annoy me intensely have now been closed up. In Camden, Islington and the City, at least, there now seems to be the beginnings of a functioning network. 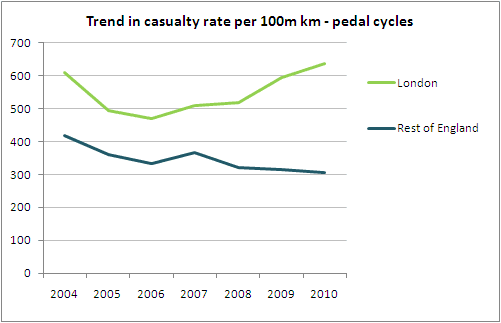 There has been an improvement in cycle permeability, and also a fall in motor traffic. This last is not an opinion, but a fact, confirmed by a useful analysis by Jim Gleeson. The segregated cycle facilities in Camden are now getting absolutely packed, confirming both the popularity of this style of engineering with a broad range of cyclists (though still not adopted widely by other boroughs, or by Transport for London on its Cycle Superhighways), and the fact that these highly-engineered routes are now being fed better by better bike permeability elsewhere. 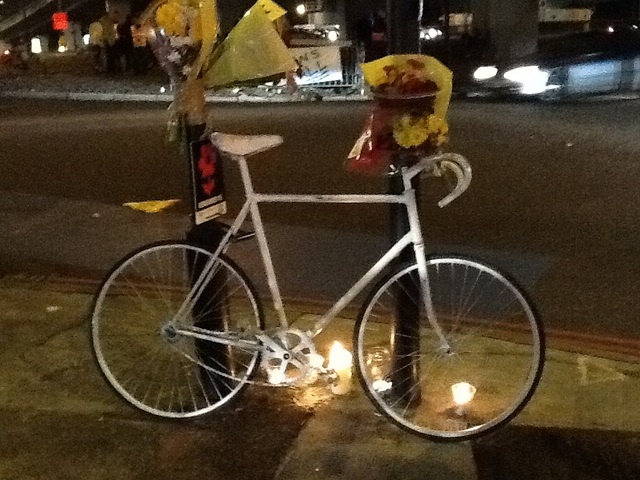 This is what we always intended, in Camden Cycling Campaign, in our campaigning for them in the late 1990s. 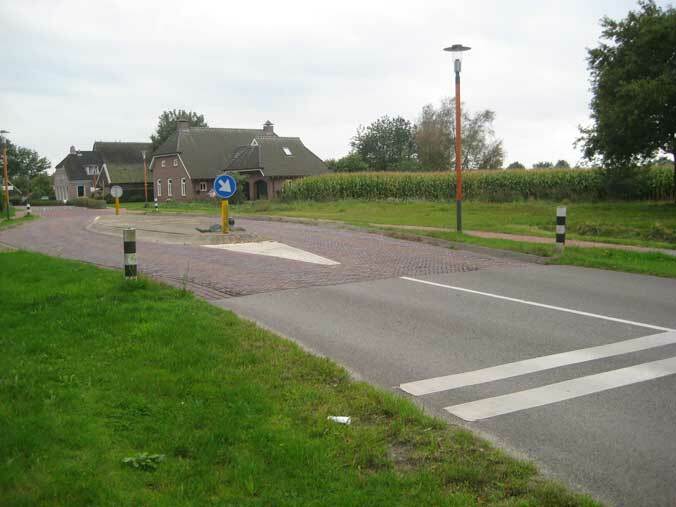 We never imagined many London roads would have segregated cycleways on them – just a few, to create a few high-profile, highly-attractive routes, in the Dutch style, fed by lower-profile permeability and cycle priority measures on other routes. The signs are that this has worked, and I felt for the first time, on this journey, that the undoing of this work has now become unimaginable. Though, as I have reported before, there have been threats to the Camden segregated cycle tracks, I can't see them being taken away now: they are too popular. Unless, that is, cyclists were to be given the whole road, as they have been in Goldsmith's Row, Hackney, where a segregated cycle track was removed. But I can't see this happening in the Camden cases – there is too much commercial activity needing servicing by motor vehicles on these streets, so the segregated tracks remain the best solution. The tracks still stop dead at the Westminster border, though the routes notionally continue. There has been no change in the anti-cycling attitude of Westminster Council (though they are, for reasons of their own budget, now starting to reduce free parking, which should benefit cycling). But the City Corporation has had something of a turn-around in attitudes, and the effects of this are noticeable. There remains much to do in the City. The very useful Queen Street and King Street corridor north of Southwark Bridge, extending Cycle Superhighway 7, that I noted in my article on the bridge, has become such a high cycle-traffic route it needs to be converted to a proper bicycle road, Copenhagen style, with priority at the junctions, and none of the silly button-pressing and confusion with pedestrian facilities that currently occurs at the Cheapside junction. The Gresham Street to Moorgate route via Coleman Street is also so popular it needs regularising, with a properly signlised crossing of London Wall, for bikes only. Diversion currently operational on the Royal College Street cycle track, Camden (picture courtesy Jean Dollimore). I noted the problem with these works back in June, and I know that Jean Dollimore, co-ordinator of Camden Cycling Campaign (whom I happened to meet yesterday on the track: two-way cycle tracks are particularly sociable places) has been working hard to try to resolve it since then. My earlier photo showed the famous UK-standard "Cyclist Dismount" signs on the track. Now the solution implemented by Camden officers looks so good it is almost as if they have been reading A view from the cycle path. Just to cast our minds back, before 1998 this road was a three-lane one-way race track for cars, with cyclists directed to a wiggly and inconvenient back street route. Just like Matthew Wright now thinks is the best, indeed the only practical, solution for London cycling. 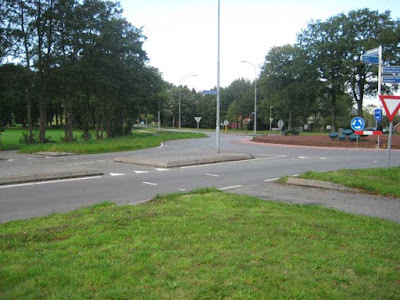 Since then one lane for cars has been removed, and the remaining two lanes have been narrowed and calmed, to make way for the cycle track and segregating strip. Now, one of the remaining lanes has been taken away from cars to keep cyclists safe for the expected 6–12 months duration of the building work. Note the child cycling in the picture. 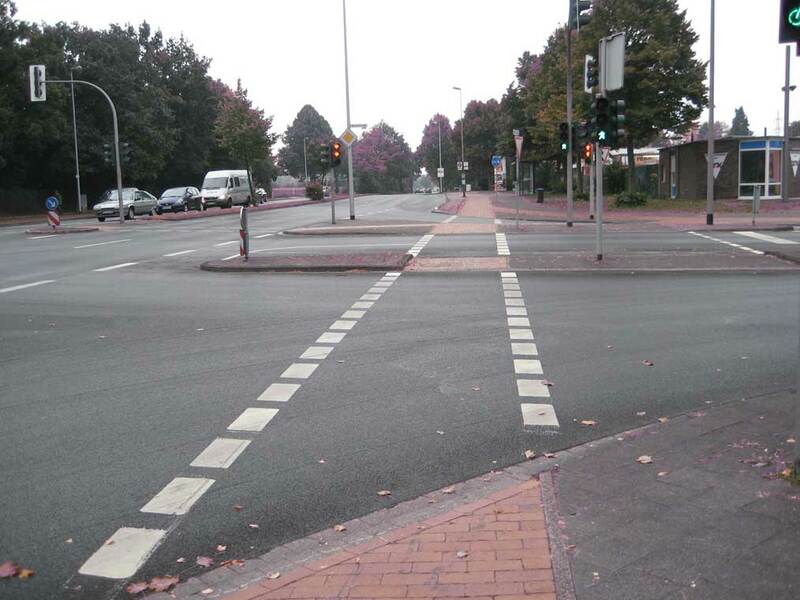 Segregated cycle tracks on main roads are particularly crucial to getting children cycling. Keeping them safe and the priorities unchanged when works are carried out is particularly critical, as the Dutch know. It seems that one London council is now aware of this as well. Unfortunately I can't lavish too much praise on Camden council, as two other important cycle routes in the borough, that I used yesterday, are also blocked by street works, and without satisfactory mitigating measures for cyclists. One is in Tavistock Place between Marchmont Street and Judd Street. Jean informs me this blockage, for cable-laying, should only last a few days. At least the closure of the track here is clearly signed in advance. The other is Malet Street, in the centre of the University of London, where major street rebuilding work, taking a long time, should have had temporary cycle facilities incorporated, on this very high-cycling street. The result of the lack of them is cyclists annoying pedestrians on the pavement. Cycle facilities in Islington looked relatively neglected, with a failure to sign routes consistently. In the City and Islington, cyclists were not directed around temporary blockages to their routes. Going back out to Brent, I found that there is still a lot of work needing doing on permeability there, in the southern parts of the borough that I don't often cycle in. 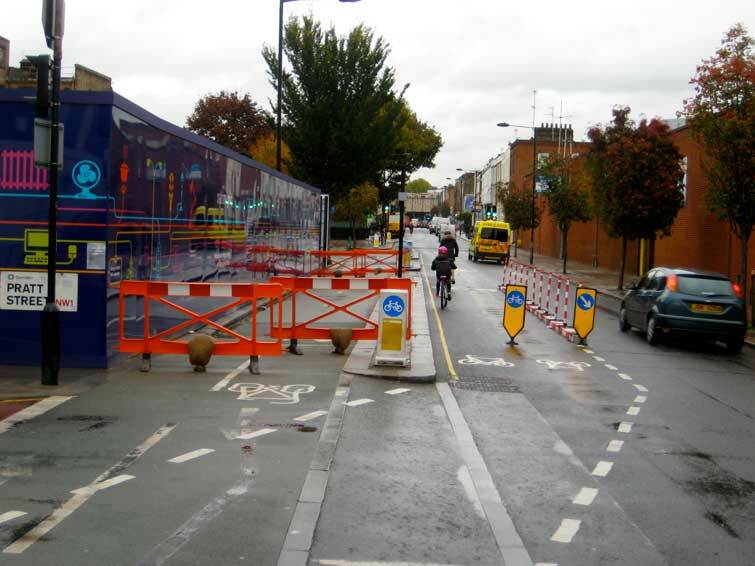 Brent did attempt at one time to create an off-road cycle path linking Canterbury Road, near Queens Park Station, to Kilburn High Road, but the details of the execution are poor, without even dropped kerbs in the right places. For this route to be useful, something needs to be done about the dangerous gyratory system around Queens Park Station. There needs to be a bypass to get cyclists from Albert Road to Salusbury Road without getting involved in the one-way system. 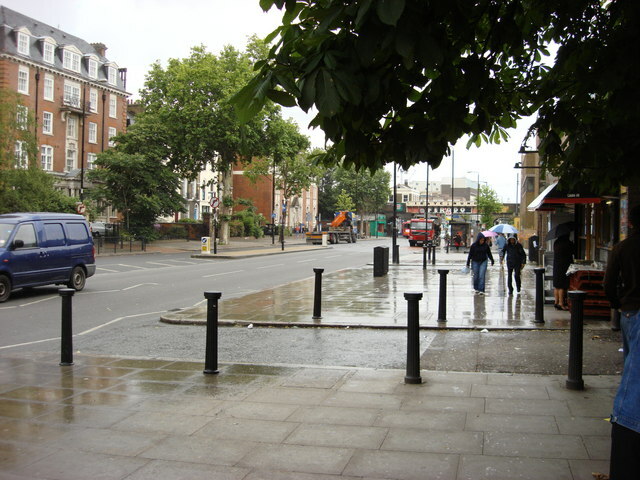 Then very simple bike permeability measures, like cut-throughs at the road closures of Chevening Road/Winchester Avenue and Christchurch Avenue, where they meet Brondesbury Park, and Lechmere Road at Willesden High Road, have not been thought of. Basically, the pattern is that conditions for cycling deteriorate as you go out from the centre of London, with fewer and worse cycle facilities, and the number of cyclists falls off correspondingly. The divide between the two cities, inner and outer London, the first of which has clearly had at least a bit of a "cycling revolution", and the other, which certainly has not, is becoming more and more striking. I don't believe in the thesis of "safety in numbers". 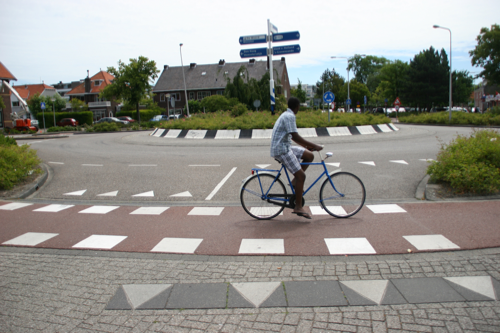 Cycling safety comes from good infrastructure design, and that then gets the numbers up – the safety does not come from the high numbers themselves. This is demonstrated by the increasing casualty rate amongst London cyclists, both absolutely and relatively, despite their rising numbers. This is a great cause for concern, and can fairly be blamed on Transport for London's lack of concern for the safety of cyclists, and their prioritisation of motor vehicle flow, as most casualties are occurring on the major junctions managed by TfL, not the boroughs. The boroughs are increasingly concerned about this, and are speaking out publicly about it. 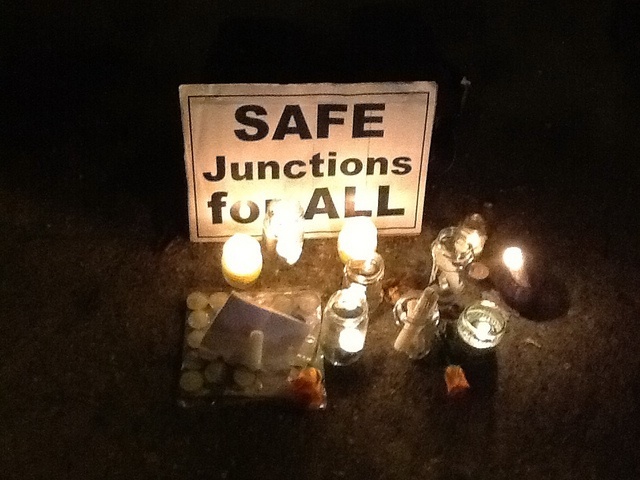 Anger, particularly at recent deaths at London's major junctions, widely commented to be unsafe for cycling, is behind the ride around the 10 most dangerous junctions. It may be that a tipping-point has been reached in central London, where the number of cyclists has now become so great that they can exert themselves, through protests, conventional lobbying of politicians, and through the London Cycling Campaign, as a serious political force for gaining real change on the still, for the most part, far too hostile roads. If so, this would generate even more cycling, and a virtuous circle of rising cycling and improving conditions would be established, the reverse of the cycle of decline that I described operating in outer London. Not wanting to be complacent, it now looks to me, for the first time, on the basis of yesterday's ride, on a cold, damp November evening, as if that point could have been passed, and that inner London could be leading a revival of cycling in the UK, ahead of such traditional English cycling towns as Cambridge, Oxford and York, and despite many of the policies of London's mayor. 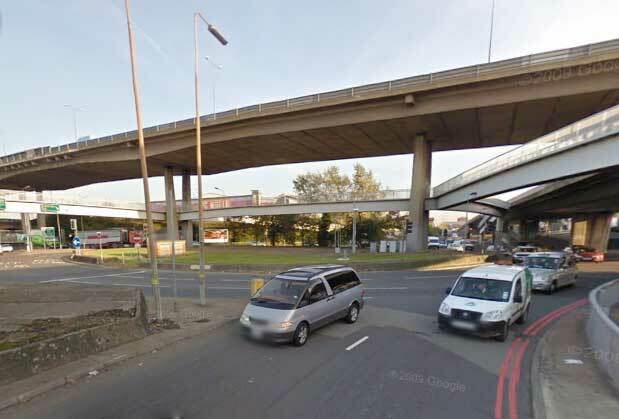 If you are interested in the Infrastructure Safari, join Brent Cyclists at 11:45 on Saturday at Gladstone Park Railway Bridge (the foot of Parkside, NW2). A meeting point closer to the centre could be arranged if anyone not from Brent wishes to join us. Helen, a.k.a. Mrs Vole, who spends more time on the internet than most, with a focus on transport (some people do have strange girlfriends), comments on how the crash is discussed in rather contrasting terms, comparing news websites and cycling forums. On the news, the focus is on the fireworks display, the smoke, fog, poor visibility, rain and wet road. On the cycling newsgroups, they talk about speed and tailgating. In those discussions there is understanding of the concept of "contributory factors", whereas the general news channels look for the "cause" of the crash. I sometimes think that perhaps all the most intelligent motorists are cyclists – at least part-time cyclists. Hopefully there will be one last casualty of the M5 crash: the government's idea of increasing the speed limit on motorways to 80 mph (129 km/h). More on this in a good article from Peter Willby in the Guardian: "Ministers are nudging drivers in the wrong direction".